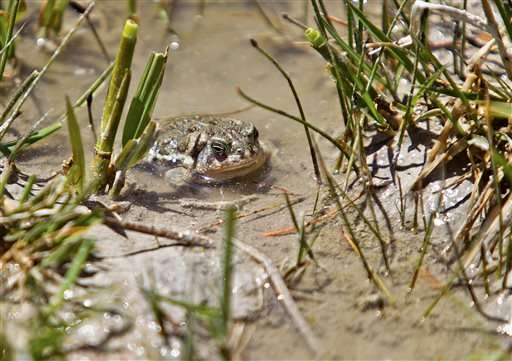 Researchers usually release Wyoming toads in the wild as tadpoles. 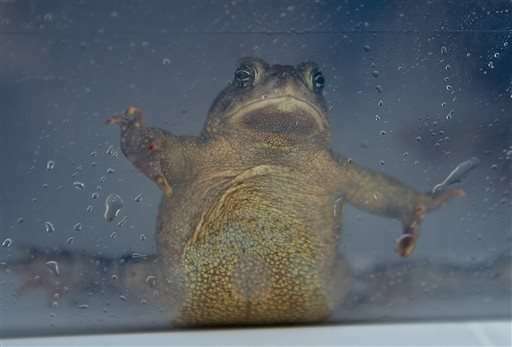 The release of hundreds of fully grown captive-bred toads is a new tactic as scientists seek ways to counter chytrid fungus. Chytrid has devastated hundreds of amphibian species worldwide since its discovery in the late 1990s. Some call chytrid the worst known infectious disease because it imperils so many species. "Since chytrid fungus cannot be eradicated in the environment, our hope is that these adult animals will have a stronger immune system and be more resilient against chytrid in the wild than their younger counterparts," said Lizzy Mack, a U.S. 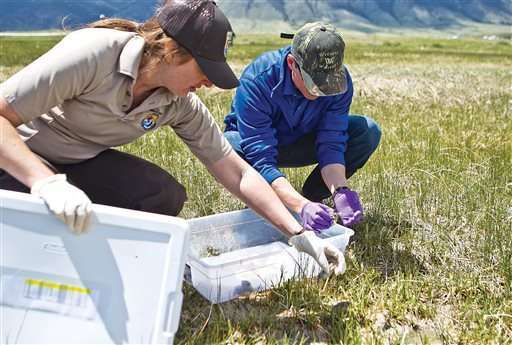 Fish and Wildlife Service scientist who specializes in the Wyoming toad. 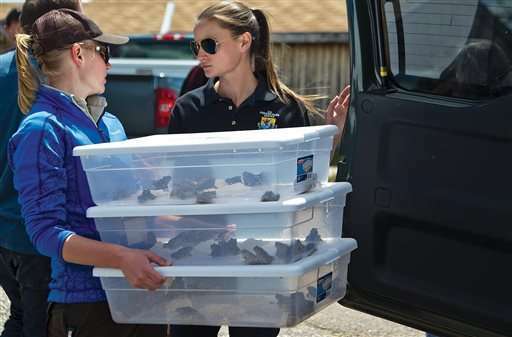 Biologists hope to test their theory when they return to Mortenson Lake National Wildlife Refuge and two other reintroduction sites in the years ahead. Each released toad carries a tiny electronic identification tag under its lumpy skin. The research should prove valuable for the handful of other captive breeding programs for imperiled amphibians, Mack said. 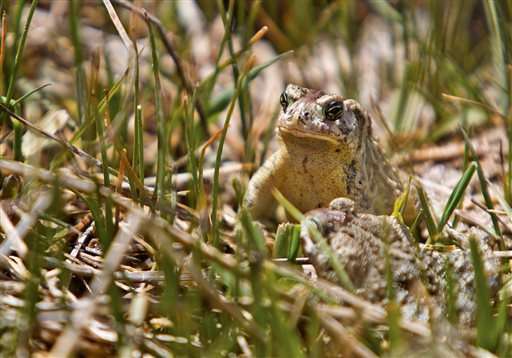 The Wyoming toad is a critically endangered species never known to have existed outside southeast Wyoming's Laramie Valley. The brown-and-green hoppers aren't exactly a majestic sight to behold—a big one measures only a couple inches. The toads were common until their numbers crashed in the 1970s; they were declared extinct in the wild in 1991. 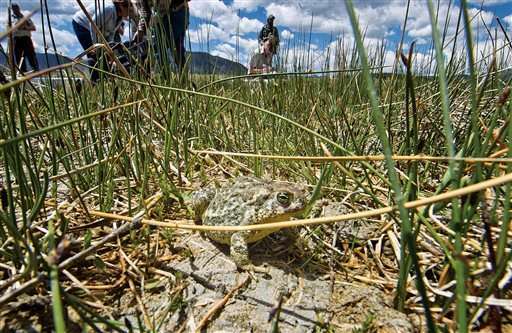 Scientists suspect the loss of habitat—irrigation projects that diverted water from ponds and streams in the high-elevation, wind-swept valley—played a major role in the toads' decline. For years, few if any captive-bred tadpoles would survive a year after release. Researchers then hit upon the idea to temporarily keep tadpoles in cages partially submerged in ponds. The cages kept predators away, giving the tadpoles time to get used to their natural environment and grow up some before being released to totally fend for themselves. Scientists credit the technique with re-establishing a year-round population of hundreds of Wyoming toads. A new federal recovery plan for the toads envisions five self-sustaining populations that could enable the toad's removal from endangered species protection as soon as 2030.